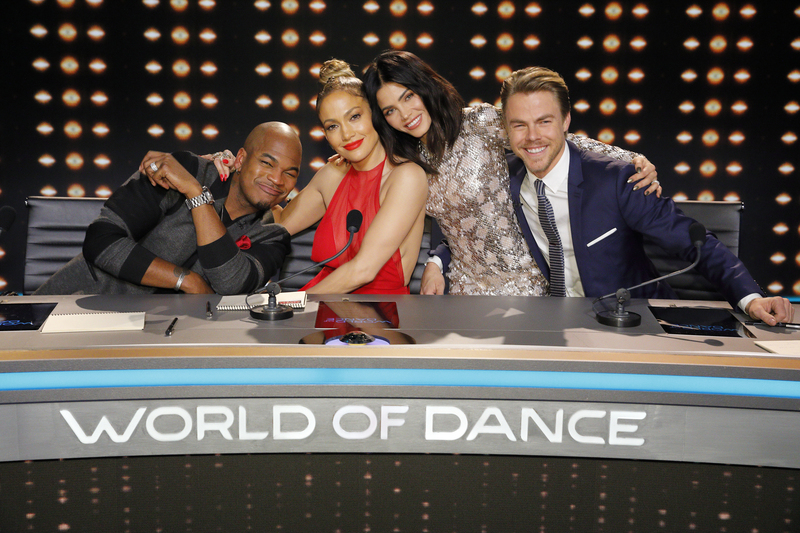 (l-r) Ne-Yo, Jennifer Lopez, Jenna Dewan Tatum and Derek Hough of WORLD OF DANCE. ©NBCUniversal. CR: Trae Patton/NBC. HOLLYWOOD—Jennifer Lopez is back in the judge’s seat. 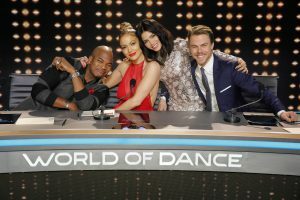 This time, she is one of the judges on NBC’s “World of Dance, “a weekly competition series, that premieres Tuesday May 30 at 10 p.m.
Judging the competition alongside the actress and former Fly Girl are dance pro Derek Hough and music artist Ne-Yo. The show is hosted by actress and dancer Jenna Dewan Tatum, who also serves as the contestants’ mentor. “World of Dance” has brought together some of the world’s best dancers to compete in epic battles of artistry, precision and athleticism. Besides bragging rights and broad television exposure, more than 40 acts also are vying for a $1 million prize. Prior to the show’s premiere, Lopez, who previously served as a judge on the singing competition show “American Idol,” spoke about getting back in the judge’s seat and how judging this competition, which is all about dance, is near and dear to her heart. Q: Is this the ultimate show for you? Because you started as a dancer, it’s almost like the ultimate show you could produce and be a part of. Lopez: It’s like a dream come true and the perfect job for me. In a sense, we created literally the perfect show for me to be a part of. “World of Dance” is a competition that’s been around, and I’ve known about them for years. I’ve actually poached choreographers from dancers that I’ve seen and innovative things. They’re known for that, so to bring that to television and then for NBC and all of us get together and decide to create an opportunity for dancers where they can be the stars, where they can create their own brand, where they can make a name for themselves, and then where they can make that type of money—nowhere (else) in the world as a dancer can you make a million dollars—was for me the best thing that I could have ever done, starting as a dancer myself. Q: Do you think the personalities and chemistry of the judges will be a key factor in the success? Lopez: It always is on these shows. Having done (“American Idol”), I know that that is key, that you have judges that are knowledgeable about what they are judging on and that they have a lot to offer, but they also have their own great personalities but also have a chemistry together. That’s the most important thing, and there has to be respect for one another and also just a joy to be around each other. We definitely have that. We were lucky. I’ve been so fortunate in the projects that I’ve been doing over the past couple of years to be able to pull together my dream team for these projects and then everybody to be awesome and nice and smart and amazing. These were, like, three first choices. It wasn’t like, “Oh, well, maybe we can get, or maybe we can get.” It was like, “Can we get Ne-Yo? Can we get Derek Hough? Can we get Jenna Dewan Tatum?” That’s what it was. It didn’t feel like a new show. Our discussions went long sometimes. Q: How have the dancers inspired you? Lopez: There were some people that we knew who are in the competition. We know their names. We know them from the dance world. And then there were some people, some juniors that we had or groups that came from New Zealand or whatever, where we were, like, “What the ****. Who are these people? Where did they come from?” They blew our mind. We even had questions about how does a junior compete against a group of adults? How is this all going to work? Honestly, it just comes down to performances that blow you away. It could be one person. It could be a group of 25. It doesn’t matter. It was very inspiring, super-inspiring. I love dance such at a core level. I always consider myself a dancer kind of first because I became a singer and an actress after I was a dancer. That was the first thing my mom put me in when I was five years old. That was my first form of artistic expression, and so, for me, it’s so part of who I am that to watch it now and to be able to see kids who are 9, 10, 11, or 12 years old, and then to see people who have been doing it for so long and are a seasoned couple dancing together, it just reminded me of all of the reasons why I love dancing, why I wanted to do this in the first place. Q: Are we going to see you dance, and will performers get extra points for performing to J Lo classics? Lopez: We danced in the promo. We were, like, “Well, let’s just try to put something in the promo.” We had a great time doing it. Q: What actually makes a good dancer? Is it coordination? Movement? What are the skill sets to actually being a good dancer? Lopez: It’s the same thing with singing in a sense. I learned that when I did “American Idol.” So many people in the world can sing, carry a note, carry a tune, sing on the beat, but not everybody can make you get up and dance or sing or feel something or cry. It’s just a different thing. That makes you an artist. Q: Are there any worries that your show and “Dancing With the Stars” might split an audience for dance? Q: How did your judge experience on “American Idol” help prepare you for this? And what, from that experience, do you bring into this? Lopez: When I came onto “American Idol,” it was such a well‑oiled machine. I really got to see how the top No. 1 show in American, reality show, competition show ran. So that really helped us and, of course, Matilda with all of her experience and all of us. Derek said when he came in, it felt like this was something we had been doing a long time. We all really had enough experience to make this kind of fly right away. It wasn’t like a trial and error. “What are we doing? How do we do this?” Everybody knew how to do it and wanted to push the envelope and wanted to do different things. And how do we make is fresher? And how do we make it newer? And how does it look production‑wise different? Everything. When we produce things, we are always trying to take them to the next level. Q: When you were starting out as a dancer, were there times when you thought, “This was too much?” Can you relate to how these dancers feel? Lopez: You really feel what it is to be a dancer and that kind of passion, which is what makes it compelling. It makes it compelling for us to watch as judges, to see that hunger and that kind of passion and all of those things.